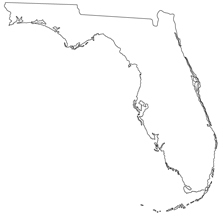 The U.S. Census Bureau has the estimated population of Florida at over 18 million people. With this many residents, the “sunshine state” has a great need for computer crime specialists to fight the battle against computer hacking and other technological crimes. The job growth rate of Florida computer forensics is constantly increasing. Throughout the state of Florida many boot camps have been available in the past as well as training sessions provided by the University of Florida Police. Computer forensics has become a very important necessity in today’s world, and those in the field of computer forensics in Florida are doing everything they can to embrace and nourish its growth. For residents of Florida, there are degrees available that are acceptable not only in terms of getting you involved in the computer forensics career field, but can prepare you for other career fields as well. Other colleges have computer forensics programs as well. Florida State University in Tallahassee, FL, offers a degree in Computer Criminology. St. Petersburg College has a Computer Crime Investigations Certificate and Bernard Community College in Cocoa offers an associate’s in Crime Scene Technology. Edison College, in Ft. Meyers, FL, has an associate’s in Crime Scene Technology as well. Also, the University of Central Florida, located in Orlando, FL, offers a graduate certificate in Computer Forensics. While Florida has quite a few campus-based colleges offering degrees in computer forensics, which is rather rare compared to most states that only have a handful or no campus-based options for this field, there are a wide variety of online computer forensics schools available to the prospective student. Giving those interested the flexibility of learning from home and online is one reason why these institutions are so successful today. When it comes to standard operating procedure in computer forensics, every state has its own laws and procedures. Currently, Florida is operating with regards to the Federal Rules of Civil Procedure Amendments. There are no additional state laws or statutes on the books in Florida concerning computer forensics or data recovery. However, the Supreme Court of Florida is considering proposed amendments to the Florida Rules of Civil Procedure as filed by the Florida Bar Civil Procedure Rules Committee*. The United States District Court, Middle District of Florida, has issued discovery standards which include preserving and producing electronic information, in addition to the discovery of electronic information*. Florida is among the majority of the states which require any individual practicing data recovery with the intent of using found information in a court of law be a licensed Private Investigator in that state. This is referred to as electronic discovery or e discovery. While this is not an issue for the Law Enforcement Agencies working across the country it could prove to be an obstacle for those working in the private sector as computer forensic “specialists”*. As of 2006 estimates for the average annual salary in Florida State was $35,820* according to the U.S. Department of Labor, while the average salary for a computer forensics examiner was nearly double that at $64,000**. Across the state of Florida the salary for a computer forensics examiner varies geographically. While an computer forensics examiner in Fort Lauderdale, FL, makes an average of $66,000**, up in Tallahassee, FL, an average annual income for a computer forensic examiner is upwards of $75,000**.